MOGADISHU, Somalia - The lawmakers of the House of the People of the Federal Parliament of Somalia parliament have on Saturday voted unanimously to illegalize the rendition of ONLF leader to Ethiopia, Garowe Online reports. The decision came after 15-member parliamentary inquiry team submitted its findings of a two-month probe into the handover of ONLF commander Abdikarim Muse Qalbi Dhagah on August 28 to Ethiopia. The house agreed that the extradition of Qalbi Dhagah to Addis Ababa by the Government as "illegal" and accused the National Intelligence and Security Agency (NISA) of misleading the cabinet on the case. During the show of hand voting, 152 MPs voted in favor of the committee report, 6 rejected, while three abstained, according to Mohamed Sheikh Osman Jawari, the house speaker, who announced the result. 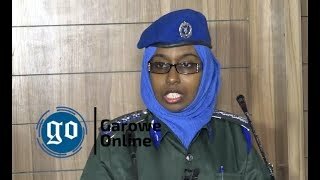 The report blamed sacked NISA chief Abdullahi Mohamed Ali "Sanbalolshe" for the rendition of Qalbi Dhagah with providing the government with incorrect information and didn't inform the Justice sector. 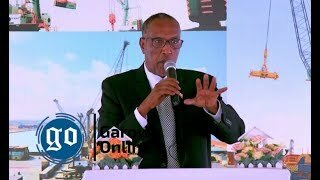 The government has referred the handover of Qalbi Dhagah whose extraction was termed illegal by the house to a previous extradition accord with Ethiopia by the former Federal government led by Hassan Sheikh. 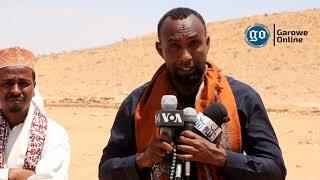 The government has described Qalbi Dhagah as a terrorist linked to Al Shabaab and a threat to the security as he was plotting terror attack in Somalia before being captured in August by Galmudug forces. Qalbi Dhagah's transfer has sparked public outrage and since then more questions have been asked. 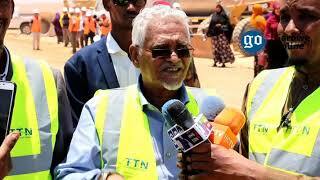 The government has been under fire for its hasty decision of handing over ONLF leader to Ethiopia. 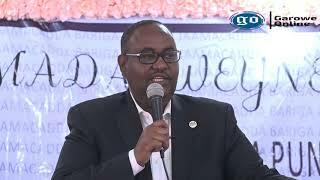 GAROWE, Puntland - The Vice President of Somalia's northeastern semi-autonomous region of Puntland, Abdihakim Abdullahi Haji Omar Amey has fired a state Minister on Wednesday, Garowe Online reports.